When Planning to Study Abroad, definitely the USA will be your first choice. Because the USA has the most top universities in the world. With a total of 154 Universities, US has maintained its leading presence in the QS World University Rankings for this year also. So most of the international students show interest to study in the USA at one of the Top Universities in USA. The international students enrolling into study programs in US Universities also increasing every year, from previous year it has risen by 10% according to Institute of International Education’s Open Doors report. The important feature that attracts international students towards US Universities is the High Standards maintained by them. Not only this, the Universities in the United States of America offers a wide range of study programs including the full range of undergraduate Majors, plus Masters and Doctoral programs. And the universities in the USA also offers advanced research facilities to its Students. Because of this reason students from all over the world come to the USA for studies. But getting admission in these Top Universities in USA is not that easy, you need to take some standardized tests like GRE/SAT/GMAT. Based on your obtained scores in these competitive Entrance Test the Universities will offer you admission into your preferred course. Through this Test Score, the universities analyze candidates ability to complete the course. Along with these Standardized tests to get admission in US Universities applicants should also take English language tests like TOEFL/IELTS/PTE to prove their efficiency English Language. Getting Admission in Top Universities in USA is very Competitive. You must get a good GRE and TOEFL Score and should have good Academics also. Only the top scorers will get admission in Best Universities in USA. Being a World’s leading international study destination, US consistently dominates the global rankings tables and it remains top in the QS World University rankings list. Almost a third of the Top 100 positions in the World Best Universities are occupied by the American Universities. And another 30 Universities are featured in the global top 300. 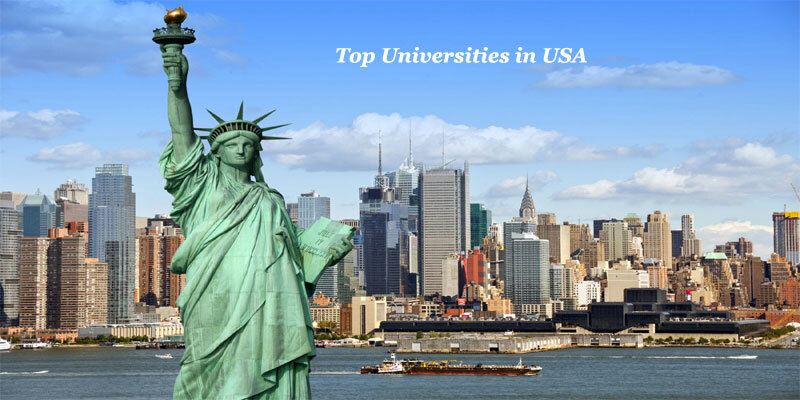 Here we have given the list of Top 10 Universities in USA, which are treated as best universities among students. This list is prepared by considering the student opinions, and ratings of the college. The all top 10 US Universities listed below are ranked within the global top 20.